3/. Leave to drip dry. Remember the best washing is a hand wash for anything waterproof. Prolong the longevity of your waterproof/breathable outer shell protection. Very dirty garments can act as a wicking agent that will allow moisture to pass through the waterproof fabric. Do not wash at prolonged high temperatures, wash at no more than 30oC and you will not damage the heat instilled characteristics of the dropliner. Use light detergents and rinse twice to eliminate residue. Dry on very low temperature settings to maximise. A light ironing on a warm setting helps restore the chemical finishes of the outer fabric. If using a restorative, try to avoid the ‘wash-in’ varieties. The breathable ability of the fabric can be inhibited as this process coats all surfaces. Liquiproof market an effective spray-on solution which is beneficial to the performance of the fabric. Beware! Products that require dry cleaning or warn against machine washing are not suitable for professional use. Some off-shore waterproof breathables are manufactured with unsatisfactory standards of seam sealing, deficiencies of this sort are difficult to detect and may only emerge after some months or under heavy stress just when you don’t need it to happen. 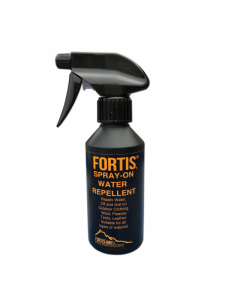 We also recommend our new Fortis Water Repellent, the perfect add on for your Fortis Garments! Fortis Water Repellent works on most fabrics and materials including; nylon, wool, tweed, fleece, soft shells, Gortex and most other man-made and natural fibres. For anything else please don’t hesitate to email or ring 01297 442180 if you would like to talk to a member of the team.